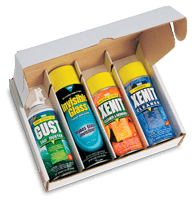 Our Auto Sampler kit lets you try 4 different products for only $24.45 -- includes FREE shipping and handling! It's a low-risk way to prove to yourself how Stoner products help you get superior results. This kit contains our environmentally friendly More Shine tire coating with 50% more ounces and no harmful petroleum distillates. 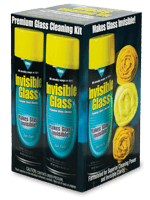 Cleans glass, windows, and mirrors so well, you'll think they're invisible. Ideal for exterior plastics on CD and DVD players, phones, computers, and more. Cleans fast with a powerful, non-streaking, non-abrasive formula. It evaporates 100% and contains NO surfactants, soaps, or foams. Ever wonder how professional detailers make cars and trucks look great -- in so little time? There's a secret product they've used for years, that's now available to you. 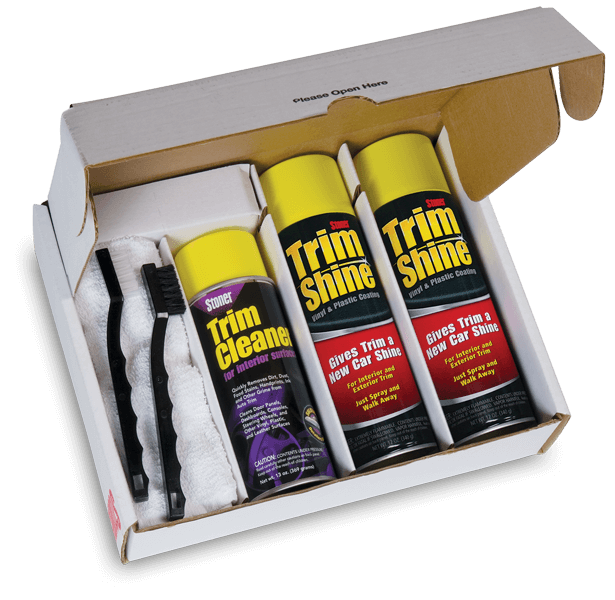 Trim Shine is an easy-to-use, spray-on coating that instantly shines and brightens dull or faded plastic, vinyl, rubber, and other surfaces. Trim Shine restores color and brilliance to bumpers, running boards, door trim, convertible tops, dashboards, seating, AC vents, hoses, door gaskets, and more. It even hides ugly white wax marks on black exterior trim. 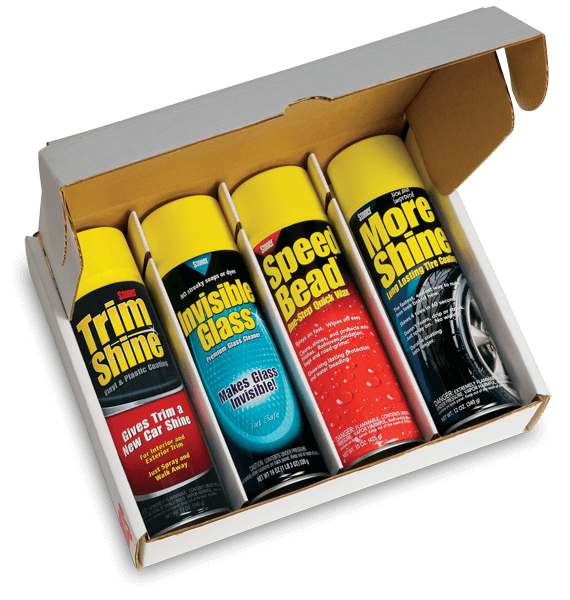 More Shine is the fastest and easiest way to make your tires look their best. This long-lasting, spray-on coating makes dull, faded tires look brand new in seconds. More Shine is preferred by professional auto detailers, finicky car collectors, car dealers, and other enthusiasts who care about their vehicles! You won't find a faster or easier way to make painted surfaces look their best than SpeedBead. This innovative, one-step aerosol quick wax performs three critical functions necessary to maintain and enhance your vehicle. It cleans, shines, and protects clearcoat, lacquer, acrylic, and enamel finishes in one step! Gentle cleaners in SpeedBead loosen and remove bug splats, sap, road grease, exhaust film, and oily road grime. They even remove minor surface scratches and water spots. Check out our other kits!